Today we went and picked more berries. It’s berry season so we have to take advantage of it while we can. Thankfully the farmer indicated that there would be berries until September so we plan to go again for sure. While my wife and kids picked strawberries I braved the wilds of the black raspberry patch. It was really overgrown with tentacles of thorny arms reaching out to grab at me. I plowed through it all with reckless abandon and emerged with a bucket of raspberries and frayed clothing. Thankfully no blood was drawn. While the raspberries are winding down (there were still quite a few but mostly small) the strawberries are giant and sweet. These berries are just incredible. If you want more information on these strawberries and the farmers that grow them check out The Family Garden. On our way back home we stopped by the Lively Organic Farm and picked up some delicious peaches and yellow plums. This is a cool farm nestled in a semi-rural neighborhood. We were informed that next weekend they would be picking my favorite which is a watermelon. Things are running a few weeks later than last year due to the long cold winter we experienced here in Oregon. Now my favorite watermelon from Lively Organic Farm is a yellow watermelon (I forget the names) but I was informed that this year they planted a variety that is a mix of red, yellow and orange flesh and super sweet. I’ll be down there when they open on Saturday to make sure I get a few. Don’t worry! I’ll be taking photos of what they look like. Until then…enjoy your Summer produce! 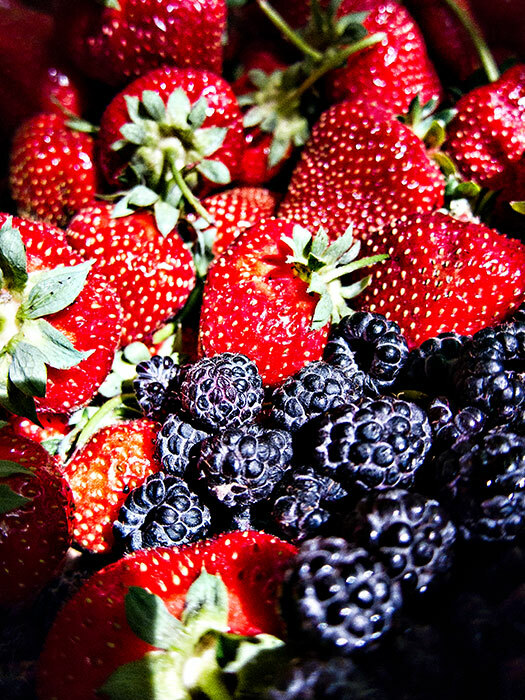 My god, I love berries. If there was a 2x2ft bowl of fresh strawberries, blueberries, blackberries, raspberries, black currants and marion berries I can die happy. @ Yu Omori – I hope you got your berries and enjoyed them! So healthy for you too. Thanks for being here.